WHAT HAPPENED: In a thoroughly entertaining back-and-forth game, Michael Gbinije broke a 61-61 tie with a 3-pointer with just over six minutes left in the second half to give the Orange a lead it would never relinquish. Two possessions later, freshman Tyler Lydon followed that up with a leaning 3 that danced on the rim before dropping in to put the Orange up 67-63 with 4:29 left, and the Orange would lead by at least that much the rest of the way en route to capturing the Battle 4 Atlantis Championship. 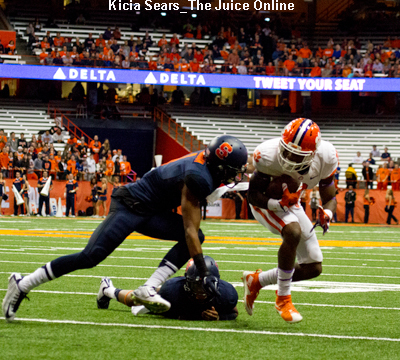 ANALYSIS: It was the first time this season that Syracuse played such a physical team, and it showed up on the stat sheet. 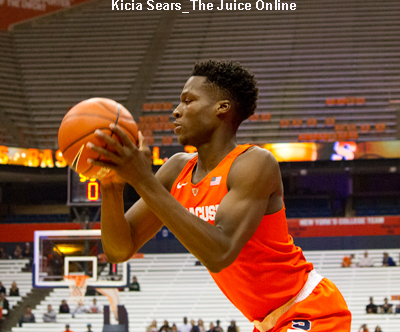 Syracuse had to survive 17 offensive rebounds from the Aggies and a -7 differential on the boards. A pair of 6’10” trees, Tonny Trocha-Morelos and Tyler Davis did much of the damage, combining for 15 rebounds against SU. But the Orange made up for its size deficiency with outside shooting (11-25) and a surprisingly strong performance from the free throw line (19-24) in holding off A&M. 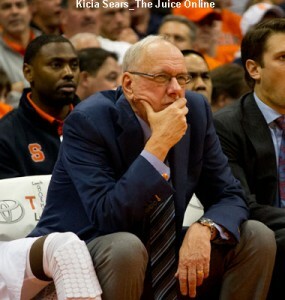 The Orange, unranked and unheralded to start the season, defeated its second ranked opponent (UConn at No. 18, Texas A&M at No. 25) in as many days, and has introduced the country to its two elite freshmen, Tyler Lydon (13 points, six rebounds) and Malachi Richardson (16). Expect the Orange to jump into the rankings in the next poll. HERO: Michael Gbinije eclipsed the 20 point mark for the third time this season, finishing with 20 points, four assists and two rebounds. He also shot 4-6 from downtown and 8-11 at the line. Dajuan Coleman turned in his best performance of the young season, collecting six rebounds and looking active inside despite being saddled with four fouls. Texas A&M’s Jalen Jones had 23 points and six rebounds before fouling out. ZERO: The Aggies struggled from 3-point land (6-20) and only got to the free throw line 11 times (and shot 63 percent). Aside from Jones, who shot 10-17, the rest of Texas A&M combined to shoot 10 of 47 from the field. WHAT’S NEXT: Another difficult non-conference game awaits the Orange as it hosts Wisconsin at home on Dec. 2 at 7:15 p.m. on ESPN2 in the Big 10/ACC Challenge.